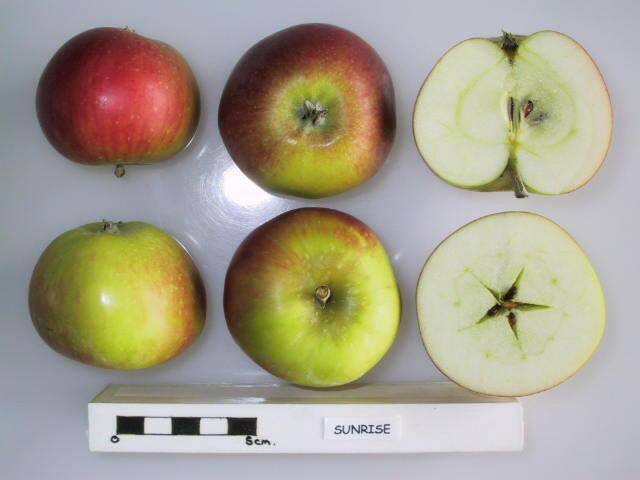 Sunrise is an attractive modern apple variety, developed in the late 20th century at the famous Summerland Research Station in Canada (home of the Spartan apple), and it is one of the best early-season apple varieties. It's easy to guess the parentage of Sunrise: the conical shape and long stalk suggests Golden Delicious, and the strong red unblemished skin colours and bright white flesh suggest McIntosh. However it is not quite that straightforward, because there is another un-named cultivar in the mix. Sunrise, as the name suggests, is an early apple variety - unlike Golden Delicious and McIntosh - so perhaps the other cultivar is responsible for the early ripening of Sunrise. Confusingly there are actually two different apple varieties called "Sunrise", since the name was first applied to an English variety from the Victorian era which is now little known. The variety described here is the modern Canadian-developed variety, and the one most widely available from tree nurseries and farm shops. Both Golden Delicious and McIntosh apple varieties tend to be easy apples to grow in the garden - heavy cropping and not much to go wrong. Sunrise is very much in the same vein and is therefore an ideal apple variety for the gardener who wants fresh apples in late August with minimal effort. It is good competition for other popular early varieties such as Katy which ripens at exactly the same time, yet has a completely different parentage (Katy comes from James Grieve and Worcester Pearmain - a far more conventional early variety parentage than Sunrise). As with all early apple varieties, flavour can be an issue, but Sunrise is undoubtedly one of the best apple varieties in this respect. It has a fairly good sweet/sharp balance, still fairly acidic but a bit sweeter than Katy. For such an early variety the flesh is remarkably crisp, and fairly juicy. It benefits from being picked early in the morning when it has been cooled overnight. It keeps for about a week in the fridge, which is better than most early varieties (and we think it is best served slightly chilled). Another big advantage of Sunrise as an early garden apple variety is that it ripens over quite a long period, so apples can be left on the tree until you are ready to eat them. Our photo shows a Sunrise apple picked from an espalier tree (MM106 roostock). Since early varieties have so little time to colour-up, growing as an espalier is the best way to get a good colouration, as it exposes the fruit to the sunlight better than a conventional bush tree. Apples that do not get full sunlight will be a very pale green colour, with patches of deep red where the sun catches them. All in all, if you want an early apple variety to grow in the garden (and who doesn't want fresh apples in August) then you won't go wrong with Sunrise. I have this variety in my back garden in London U.K. Just ate the last one today Sept 8th. As described, nice balance of sweetness and sharpness. The earlier ones End of July only a third red but by mid August 2/3rds Red. I love them. They don't keep well so I pick and eat, or keep on the fridge. No windfalls either! Just picked some up from the Kanata farmer's market. Mildly sweet, incredibly crunchy and crisp. Slight hint of crabapple-like tartness. Appearances vary, roughly 2/3 green with the last 1/4 a blush of red. Would recommend for folks with low sugar tolerances as the sugar content is not too sweet (just right in my opinion). Eating one from Canada, bought last week of Sept. from probable August harvest. Already quite mealy, so not a great keeper. Pretty though, and a lovely sweet flavor. Would never guess that Macintosh is anywhere near the family tree. This is just Golden Delicious in fancy dress. We grow this variety in southern Oregon (Rogue Valley) and it does quite well. Saw these apples for the first time last week. Given their size, decided to try in a pie. Texture was slightly soft for baking, but overall flavour was good. Mild/sweet flavour balanced well with granny smith in pie. Fantastic (Sweet!) eating apple. Does not keep! After two days, apples are rapidly browning. The pictured fruit shows much more red than the Sunrise apples I've had -- much more yellow background showing, with some blush on a cheek. These are quite good, maybe a slight pear flavor, with crispness and juice. I bought them at an organic foods market, and remember they had Gravenstein at the same time. The Sunrise were imported from Canada, the Gravensteins probably Michigan-grown. Ate this variety at roadside fruit stand in Osoyoos, Canada while vacationing 8/13. Very good, just as described!! Picture looked slightly different, more green with just a blush of red, but taste is spot on. Nice sweet/tart balance as mentioned and wonderful crisp bite. I am from the Willamette valley in Oregon which has it's share of fruit orchards, but never heard of this variety. Will it grow this far south? Seems like it would make a good baking apple as well as fresh eating. Use / keeping: 1 week Must be kept in the fridge.